We were watching Miss Aretha Franklin, undisputed Queen of Soul and Diva in Chief. She was a vision in white last night on Wolf Trap’s main stage, complete with bling and, I must note, a slit in her gown up to HERE. We will be honored just to be there. 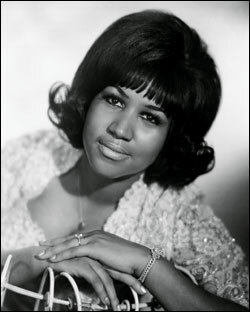 I’m not the world’s biggest Aretha Franklin fan, and neither is my friend. We were there to see a national treasure, one we realize won’t be here to perform forever. “True. Cher is immortal.” Comforting, that. We’re all raised with different perspectives on music — I came from an Elvis household and went to school with Beatles and Simon & Garfunkel fans. But there are certain pop music truths that transcend the trends our parents graft onto us, and Aretha Franklin is one of them. Not just a singer, not even a rockstar…a truth. And it was an honor to see her in concert. Many thanks to my employer for planning cool staff events, letting staff vote on which concert to attend, and taking care of everything so all we had to do was show up. This would make a good “life’s list” type thing. See all of the remaining legends. Wouldn’t it? I might have to be a bigger music fan to add that, though.